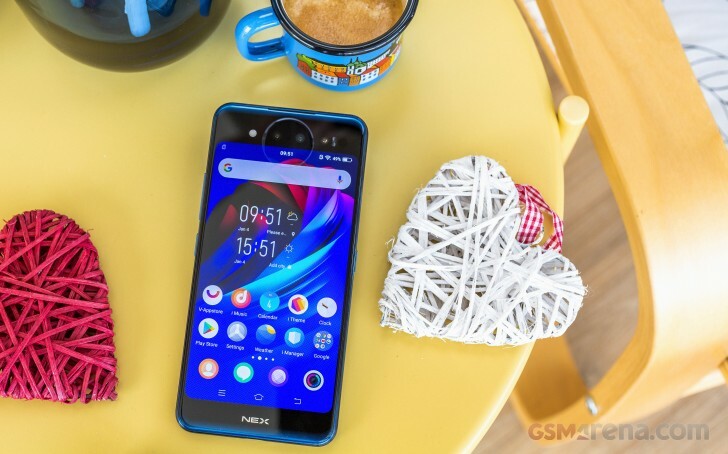 While technically the display area is covered by glass too, the NEX Dual Display is definitely more display than anything else. Vivo really went all out in this department. 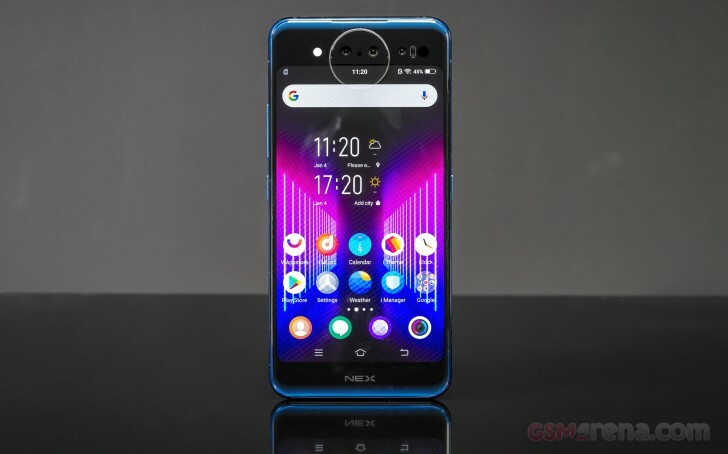 Well, to be fair, compared to the original NEX S, the main display did get a bit smaller at 6.39 inches, compared to 6.59, but even so, it is still a huge panel. Plus, if we count the second 5.49-inch panel in, the admittedly subjective screen real estate math puts the NEX Dual Display in a league of its own. Better still, both panels are of the Super AMOLED variety. So, not only did vivo do some proper panel shopping, going for OLED over LCD, said panels were also sourced from Samsung, potentially speaking to their quality. Naturally, we tested both panels, starting with the exuberantly tall, even by current standards, 19.5:9 main unit. It's a decent AMOLED unit, but not really on the same level as the ones Samsung puts in its current flagships. The main beef we have with it is that it is a bit on the dim side. It is still very much okay, but a max auto mode would have been a neat addition to the mix. Actually, looking at the rear 5.49-inch panel, we see pretty much the same results brightness-wise. The smaller, or more specifically, less tall and slightly wider 16:9 rear display does put out a few extra nits, which can definitely be attributed to having the same number of OLED pixels across a smaller surface area. Other than that, the two are really comparable in terms of performance. Their brightness could potentially be capped as well to save on some battery. THat's just a guess, of course. Plus, the duo rarely turns on at the same time, so potential extra battery strain is hardly a consideration. Sunlight legibility is also quite close on the pair of screens. Something we were actually wondering about since the rear panel originally looked like it might not be fully laminated. Or at least that's what we thought, considering the round camera module that is also molded out of the same glass finish. A phone disassembly online, however, revealed that the panel and glass are, indeed, part of a single module, proving our original theory wrong and frankly leaving us a bit impressed from an engineering standpoint. Just like the other aspects of the panels, color accuracy turned out to be very similar. Out of the box, neither came close to what we would consider "color accurate'. The main one scored an average deltaE of 6.3 and a maximum of 11.8. The vivo display settings menu isn't particularly full of color adjustment options either, just a simple temperature slider, which we did utilize to warm up the otherwise cold color output a bit. That brought down the average deltaE to 5.1 and the maximum to 9.7 - still far from color accurate. The back panel scored a very similar average deltaE of 6.7 and a surprisingly consistent maximum of a whopping 27.9 in one of our test patterns. Frankly, we would have noticed such a major mismatch in regular use and since this was not the case the only logical conclusion was that the OS wasn't playing nice with our color pattern generating software on the rear panel. To be perfectly frank, we expected much more severe issues when we noticed that the two panels share their display settings. We get it, both are FullHD in resolution and for most use cases, the phone simply switches from one to the other, only having to deal with scaling issues for certain apps. Rarely are the two panels enabled simultaneously. Still, it would have been nice to separate brightness and color adjustments for the secondary display. This is actually part of a bigger criticism we have towards vivo for not really ironing out some of the kinks of using two full-featured displays. For example, the app scaling, or rather a re-scaling issue, depending on which display is in use is a real thing. There is a settings menu available that appears to be designed to handle that very same issue on a per-app basis, but it was clearly unfinished and not properly implemented on our review unit. This meant that most third-party apps that scaled, manually or otherwise, to 19.5:9 for the front display were left severely pillar-boxed on the rear one. Far from ideal, but also far from the only complaint we have about vivo's implementation and feature set for the second display. But, more on that in the software section. The vivo NEX Dual Display edition is definitely a beefy phone. With a body measuring 157.2 x 75.3 x 8.1 mm and weighing in at just shy of 200 grams, it is clearly in the same weight category as other massive phablet devices, such as the Samsung Galaxy Note9. We have become rather accustomed to seeing large 4,000-ish mAh batteries on said devices. After all, they are at least roomy if not anything else. That, however, isn't exactly applicable to the NEX Dual Display. Naturally, that second screen and all its components take up valuable internal space. This is likely one of the reasons why the NEX Dual Display is only packing a 3,500 mAh battery. Again, we say "only" pretty relative to the general phablet market. In practical terms, 3,500 mAh is still plenty of juice to go around. Now, that being said, there are a few things to consider here. Two panels definitely draw more power than one. Then again, there are very few circumstances in which the two panels can even be active at the same time, especially for prolonged periods of time. Using the always on display feature on both panels might suggest otherwise, but the phone is actually smart enough to use the proximity sensor and has AOD active only on the upward facing panel. Still, at the end of the day having the always on display feature on will still eat through around 10% of extra battery on a charge. On the flip side of the display count argument, it is noteworthy that vivo opted for efficient OLED panels on both sides. That definitely brings the overall power consumption down. The native FullHD resolution of the panels helps to some extent, as well. Our battery tests were automated thanks to SmartViser, using its viSer App. 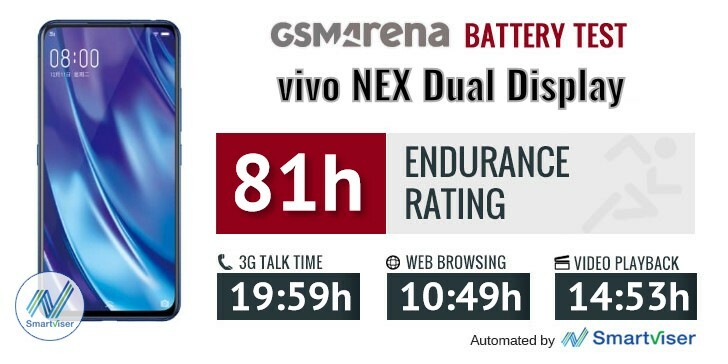 The endurance rating above denotes how long a single battery charge will last you if you use the vivo NEX Dual Display for an hour each of telephony, web browsing, and video playback daily. We've established this usage pattern so that our battery results are comparable across devices in the most common day-to-day tasks. The battery testing procedure is described in detail in case you're interested in the nitty-gritty. You can check out our complete battery test table, where you can see how all of the smartphones we've tested will compare under your own typical use. In terms of charging speed, using the included 22.5W charger fills the battery at a rate of around 55% per hour. Accounting for all the trickle charge cycles and other variances a full charge from 0% to 100% takes just under 2 hours. With a fully drained battery a quick half hour charge gets you to about 30%. Not bad at all. The tech has already started trickling down the vivo ranks as well. Certain devices like the vivo V11 support something called Dual Engine Fast Charging - a system, by all accounts very similar in principle to VOOC and Dash. However, details have been scarce regarding it - we only have this image below. With all that said, we suspect the NEX DD uses the same type of charger as it's listed to support a trio of odd output ratings: 5V@2A, 9V@2A, and 10V@2.25A. The first one is pretty standard, while the second voltage upgrade to 9V is indicative of a whole other kind of fast charging methodology, like 18W Quick Charge. Looking at the final output closely, however, leads us to believe that vivo is actually using an internal battery arrangement similar to the of Oppo's SuperVooc Find X Lamborghini. That is to say a pair of batteries connected in series. The only difference is that, as far as we know, the Find X Lamborghini has a pair of those linked in parallel for a total of four and a rough max input of 50W. So, we guess, technically this could be "Dual Engine" technology. Regardless, the bottom line here is - don't lose your included charger since it is rather special. Plus, that 9V@2A output rating does potentially make it rather flexible since it should be able to properly charge Quick Charge devices as well. In terms of loudness, the NEX Dual Display just barely made it into "Excellent" grade territory. On the plus side, the sound it produces is actually pretty clear. 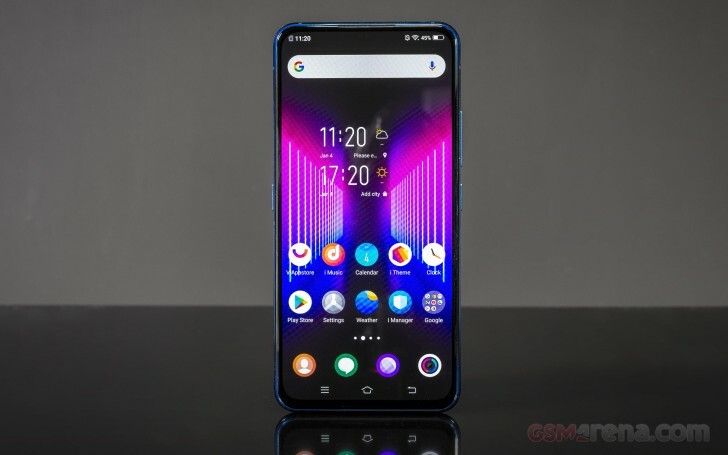 vivo NEX Dual Display Edition started off brightly in our test, delivering nicely clean output with an active external amplifier and garnishing that with a loudness that's well above average. Headphones affected several readings, although the hits weren't too major. Frequency response, intermodulation distortion and stereo crosstalk all degraded by moderate amounts dropping the rating from excellent to good. Better yet, volume remained high, making up a solid overall showing.